I know, I know. 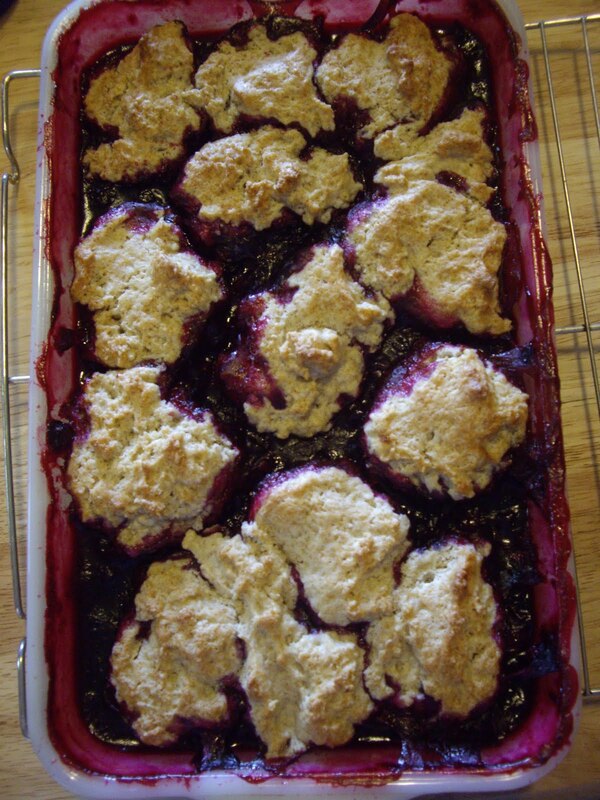 Another blueberry recipe. Hey what can I say? They are in season and I grow them. Blueberry cobbler is just simply wonderful. It is homey and delicious. You will need a 2 quart baking dish. Combine the 1/3-2/3 cup sugar and cornstarch in a saucepan. Add the water and blueberries. Cook over medium heat until thickened and bubbly. Turn heat to warm and keep filling hot while making the rest. In a medium bowl, stir the flour, remaining sugar, baking powder, and cinnamon. Cut in the butter until mixture is crumbly. Stir together the egg and milk. Add to flour mixture and stir to moisten. Pour filling into baking dish. Drop mounds of dough on top of the filling. Bake in the preheated oven for 20-25 minutes until a toothpick inserted into the topping comes out clean.